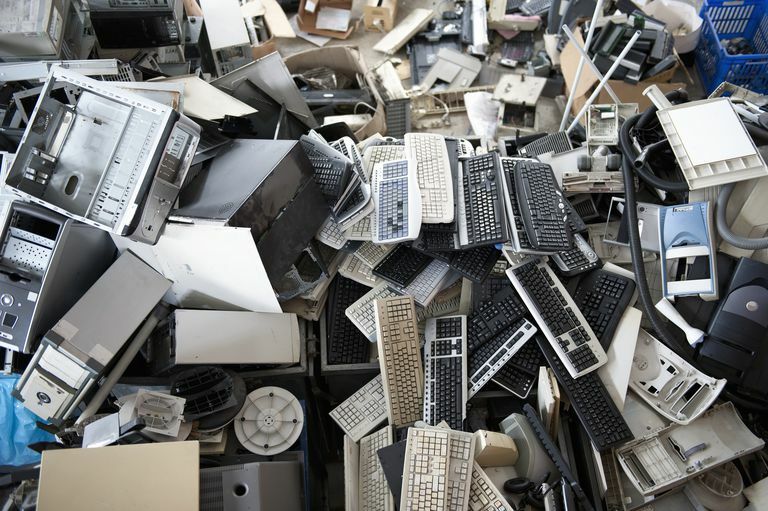 Staples will recycle lots of devices, regardless of the brand, condition, or store where you originally purchased them. Not only will Staples recycle your old desktop, laptop, tablet computers, and peripherals, they'll also do the same for your eReader, shredder, monitor, GPS device, battery backup, digital camera, MP3 player, ink and toner, external hard drive, cordless phone, wireless router, and more. Staples keeps a complete list of acceptable and prohibited items on their Recycling Services page. What Are the Benefits of Recycling With Staples? Recycling with Staples comes with more benefits than just getting rid of your old electronics that are taking up space in your garage or closet. With the Staples trade-in program, you're able to get money back just for getting rid of your unused devices! Visit the link below to learn more about how the trade-in program works and which devices are supported. You can bring your devices to a store or ship it through the mail. Either method will reward you with a Staples eCash Card. When recycling empty ink and toner cartridges, you'll get $2 back in Staples Rewards for each and every one. How Do You Trade-In Devices With Staples? Whether you're trading in your device online or in person, you can get a quote for how much money you'll get in return. To do that, begin with the GET STARTED button through that link above. If you'd rather visit a Staples store and get the quote there, you can do that, instead. Search for your device or browse through the categories until you find it, and then answer a few questions about the condition and functionality of the device. You may also have to submit a serial number or other identifiable number before you can continue through to sending the device in. For example, if you're trading in an old iPhone 7, navigate to IPHONE > iPhone 7 to find the phone that matches yours — the one that lists the same carrier and hard drive capacity as yours. Then, answer a few questions about the device, like whether it powers on, if the screen is cracked or broken, and if you've disabled Find My iPhone and any other account information. Some devices might have different questions. For example, if you're trading in a laptop, you're asked if you also have the power cord. Finally, you can get a quote for how much you might get back for your device, with the SHOW OFFER button. You can then print off the quote and take the device in to Staples or continue online by clicking GET PAID and following any other instructions. There are lots of other sites where you can also sell your old electronics for cash, some of which might offer more money than Staples. How Do You Recycle With Staples? If you're not interested in trading in your electronics, or it can't be done through the mail, just bring them to your local Staples store to have them recycled for free. All U.S. Staples stores support recycling electronics, except for Staples Copy & Print Shops, and you can recycle as many as six items per day. Though Staples will erase all the data on the hard drives that you recycle, we still recommend that you do it yourself first to ensure that none of your private information is still lingering before getting rid of it. See How to Wipe a Hard Drive for a complete tutorial on permanently erasing everything on your hard drive. It's easy to do and the software required is completely free. Businesses with more than 20 employees can benefit from Staples Business Advantage for their recycling needs, which partners with Electronic Recyclers International to securely destroy all data in bulk on mobile devices, servers, computers, and other devices. Are You Restarting Your Computer the Right Way?